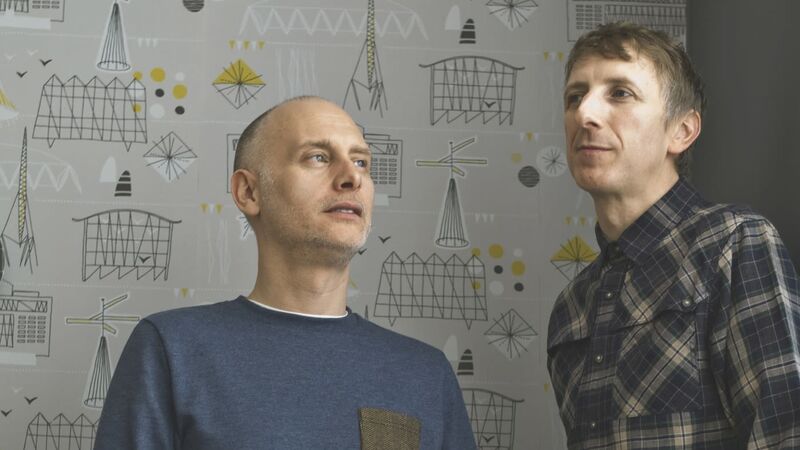 In our latest installment of skinflint Meets, we caught up with Keith Stephenson and Mark Hampshire, founders of interiors brand Mini Moderns, and asked them about pattern, trends, where their influences come from and, of course, what their favourite lights from the skinflint collection are. 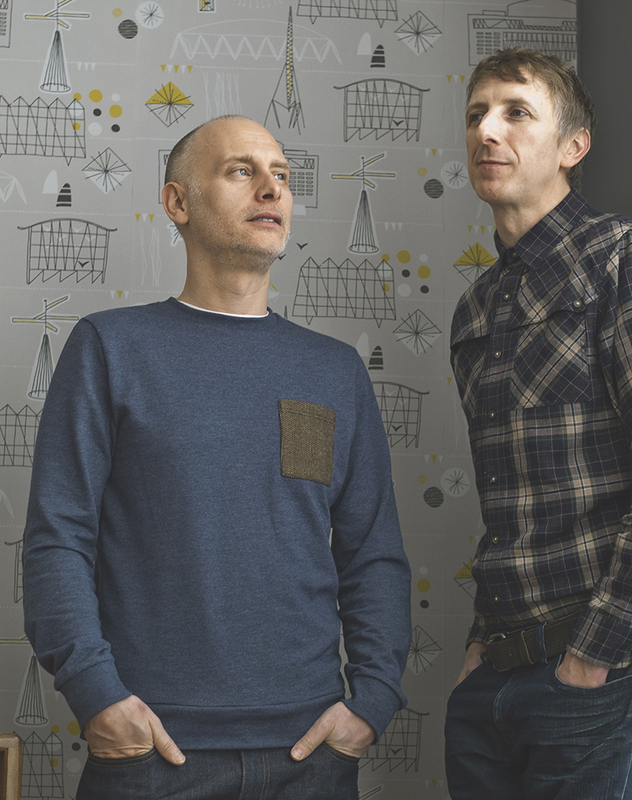 skinflint: Mini Moderns celebrates 11 years this year, what made you start the company? MM: Back in 2004, Mark and I were commissioned to design a wallpaper collection for south London interiors boutique, Places and Spaces. Wallpaper was still early in its renaissance – so it was an intriguing project. The resulting collection was an immediate success – gaining a lot of international press attention – and was shortlisted for Elle Decoration’s Future Classic awards. We were then commissioned by the publisher Rotovision to write a series of four books on pattern. The two projects came together to give us a taste for designing wallpaper – and Mini Moderns was born. MM: I (Keith) worked as a textile print and graphic designer for various fashion companies, ranging from jeans wear to cult fashion brand Red or Dead, where I worked for several years. Mark had worked in television and had also created his own interior designer-maker business, selling his collections through Heal’s. We met at a branding agency in the mid-nineties. Here, we were always grouped together as a team for projects – so we knew we worked well together and had a similar aesthetic, a similar approach to projects and, most importantly, a similar sense of humour! We always felt that our skills were not fully utilised in the design agency environment and so, when we left our full-time jobs, we set up an independent branding agency specialising in retail and lifestyle brands. We were determined not to be pigeonholed by job titles or clients – but in setting up Mini Moderns, after the success of the first collection with Places and Spaces, we were able to utilise all our experience, including design, print and production, as well as our branding expertise. skinflint: What was your first design and how do you think your work has changed since then? MM: Our first design was ‘Do You Live in a Town?’ which continues to be a popular seller today. Not much has changed in our approach to our design work – it still has a similar aesthetic, since our sources of inspiration haven’t really changed. It also follows our philosophy of creating ‘pattern with a story’, which is a conceptual template that we continue to work to. All our prints have a personal story behind them, referencing our interests and experiences, ranging from social history to television, from travel to childhood memories. We try to put as much detail in our patterns as possible – sometimes hiding elements within the design that slowly reveal themselves to the observer. This has become something of a Mini Moderns signature style. We also work in a limited colour palette of 12 core colours, which makes our designs instantly recognisable as Mini Moderns. Our collections are so personal that new work tends to be exactly where our heads are at present. They are almost like visual diaries – so it is hard not to choose something from our most recent collection. But each collection tends to have its hero print/s. Our first collection, ‘Do You Live in a Town?’ has always been a favourite – and one of the houses depicted on it became our logo – so it was the start of everything. Two of our favourite designs from the Day-tripper collection are ‘Festival’ and ‘Whitby’. The latter is probably one of our most recognised prints, and the seaside town that inspired it is such a big part of our childhoods. We really wanted to try and capture the ruggedness of Whitby and its surroundings in the print, and every time we look at it we feel like it evokes the area where we grew up and spent our holidays as kids. We love the ‘Paisley Crescent’ wallpaper from our Buddha of Suburbia collection, as it perfectly sums up what we try to do with our designs, which is to tell stories. At first glance it may look like a straightforward Paisley design, but on closer inspection reveals a series of suburban houses, starbursts, trees and bicycles, which all tell the story of the Buddha of Suburbia, the novel by Hanif Kureishi, which was the inspiration for the whole collection. Another very personal print for us is our ‘Dungeness’ toile wallpaper from our ‘Hinterland’ collection, which features an area of the Kent coast that we know and love. This print also features, among the shingle and beached abandoned boats, the Mini Moderns beach house, which we spent two years renovating. The new collection, ‘Saturday Night/Sunday Morning’, is very exciting for us. It is a collection of 10 new wallpapers, and we really would find it hard to choose a favourite from the whole collection. In fact we are currently redecorating our house and are yet to agree on which wallpapers we want to put up! skinflint: How have you seen interior design change in the past decade and which trends have you seen emerge? MM: When we first started Mini Moderns, the mid-century modern style was not very commonplace, whereas now it has become such an established style. The big trend in interiors that has really taken hold in the past ten years is industrial style. It’s proved to be very popular, probably because it reflects people’s aspirations to live in more adaptable, multifunctional spaces. Aesthetically, industrial style is also very versatile, as it acts as a neutral backdrop to mix in several other prevalent looks. It works really well mixed with mid-century furniture, or as a blank canvas against which you can layer pattern and texture – including botanical and more graphic styles – two other trends that have emerged in recent years. skinflint: What are your influences? How do you come up with new designs. We create pattern with a story – and our collections are primarily based on personal experiences. This can be travel – trips around the UK inspired our holiday-at-home collection ‘Day-tripper’. We are influenced by literature, film and television too – for our ‘Buddha of Suburbia’ collection we created our wallpaper patterns as an illustrated homage to the novel of the same name by Hanif Kureishi. We also watch a lot of social history and pop culture programming, which can give us a mood or theme that we will then visually pursue. Printed ephemera and vintage fabrics and patterns from the 1920s right up to the 90s are also something we find inspiring. We are particularly influenced by mid-century design – mainly because when we were teenagers in the 1980s, fifties and sixties clothes and interior products were really cheap. So we always wore second hand clothes, or made things out of mid-century curtains to wear when we were going out. In our teenage years were always watching re-runs of things like The Avengers and other classic TV shows. This has directly influenced the ‘One Day’ print from our latest collection ‘Saturday Night/Sunday Morning’, which features kitchen sink dramas from the 40s to the 60s – films we watched on the newly launched Channel 4 on our black and white portable tellies in our bedrooms. skinflint: What is your own home like? Do you favour a particular period? MM: We would describe our home as ‘warm modernist’ in style. Our live/work space was a new-build when we bought it 14 years ago, so it was a blank canvas. The layout is really well thought out, but it did rather lack character. We decided to treat it as a 1970s town house, and that helped us overcome its new-build anonymity. We are surrounded by our collections of objects and our own patterns. When we design our collections we always ask the question, ‘Would we want to live with them?’ We end up redecorating with new wallpapers each time we launch a new collection – which can be exhausting, but it does prove that we do indeed like living with our designs! We always design to mix and match, and because the patterns in our home are all Mini Moderns designs, they sit together in an eclectic, yet cohesive way. This has a direct impact on the décor, which is of no particular period. 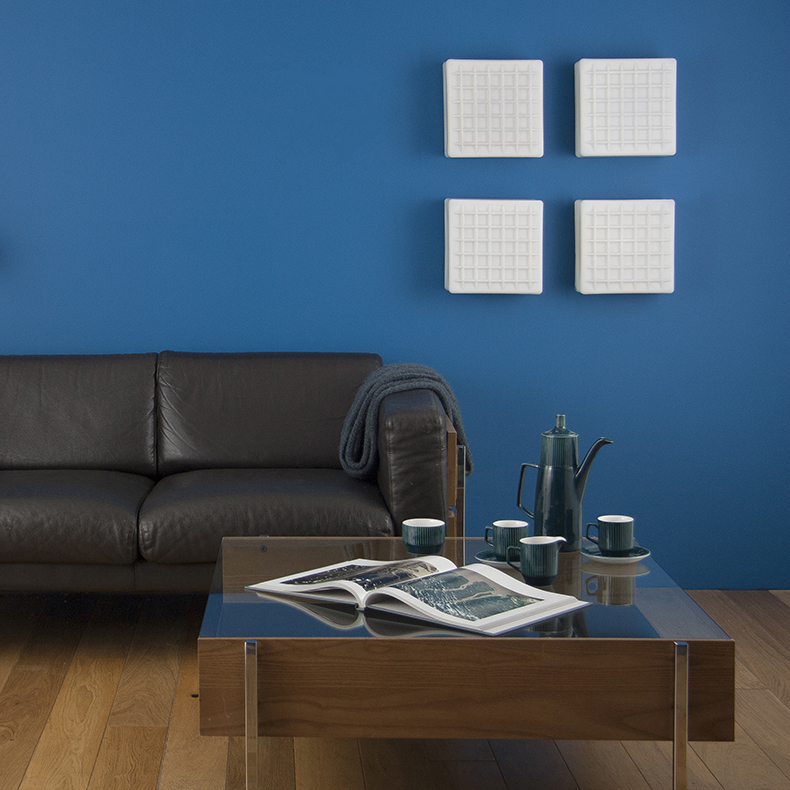 It is quite a mix of furniture and design that we love – we are by no means mid-century purists. skinflint: The majority of your products are made in the UK. Why is this important to you and do you think it’s increasingly important to customers? We produce our wallpaper and linen fabric with a small and highly skilled factory in Norfolk – one of the last flexo wallpaper printers in the UK. Because we know the whole team, we know who is mixing our colours and who is printing, which is very reassuring as we are confident that we will get exactly what we want. Our bedding, recycled paint collection and cushions are all made in the UK, in factories that we know follow exemplary working practices. UK production also means the products travel less, helping us to reduce our carbon footprint. Finally, working with UK companies also allows us a flexibility which has enabled us to grow our brand at a rate we can both afford and feel comfortable with. MM: Most our design influences overlap, with the nuance that Keith is more textile influenced and Mark is more product and architecture inspired. We both admire the work of designers from the 20th century who were not afraid to work across disciplines – Gio Ponti and Alexander Girard are amongst our favourites. We both share a massive admiration for Terence Conran and the whole history of Habitat – we even have a collection of back issue catalogues – the 1971 edition being our absolute favourite. And then we have some pure graphic design heroes like Lance Wyman, Paul Rand and Peter Saville. skinflint: In your house was on fire, what, apart from family and pets, what would you attempt to save? MM: Probably our record collection and our vintage magazines – all of which we have had all our lives. And then there’s our collection of Carltonware moneyboxes – they’d need to come too. skinflint: What’s next for Mini Moderns? MM: We are on the verge of launching our Saturday Night/Sunday Morning wallpaper Collection. This will be complemented by a new cushion and fabric collection, which is all very exciting. The collection is based on our teenage years growing up in the north of England. We are also lucky to be working with licensees to create a variety of products, including giftware, kitchen linens, home fragrances, window film and vitreous enamel heat shields, which all feature our most popular prints. So it is all quite varied and very exciting. skinflint: What are your top three skinflint lights and can you tell us why you like them? We love the look of these old ship lights and we have something similar in one of the bedrooms at our beach house at Dungeness - they look great with the Stone colourway of our Gulls and Whitby wallpaper – with the bronze casing adding a warm look. In our house, we don’t have much scope to incorporate interesting pendant lights – so we are always excited to find a stylish wall light, as it is one of the ways we can bring personality into our space. 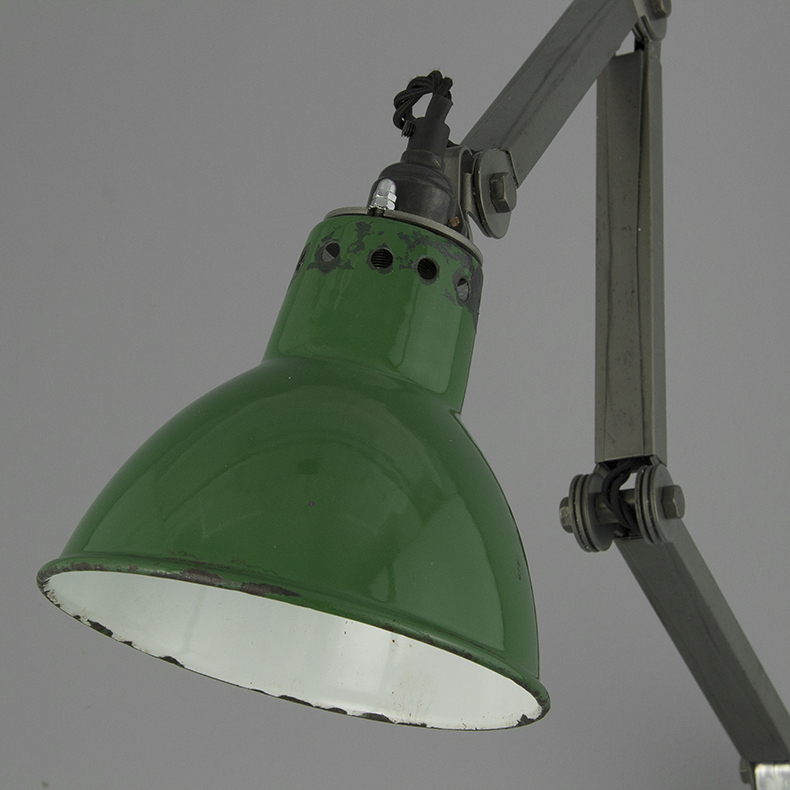 Mark is a huge fan of emerald green and we are both big fans of enamelware too. Of course, with our love of pattern, we were bound to be attracted to these beauties. The moulded form has a beautiful sculptural feel and they feel like they would successfully straddle domestic and commercial spaces in style.